Weather: Ideal weaather. A clearing front produced chilly W/WSW/NW winds 5-35 mph. Rain showers early, then largely sunny skies with beautiful cumulus clouds forming. Vis 40 K. Temps 7.2-16.1 degrees C.
Observation Notes: Just a spectacular day! 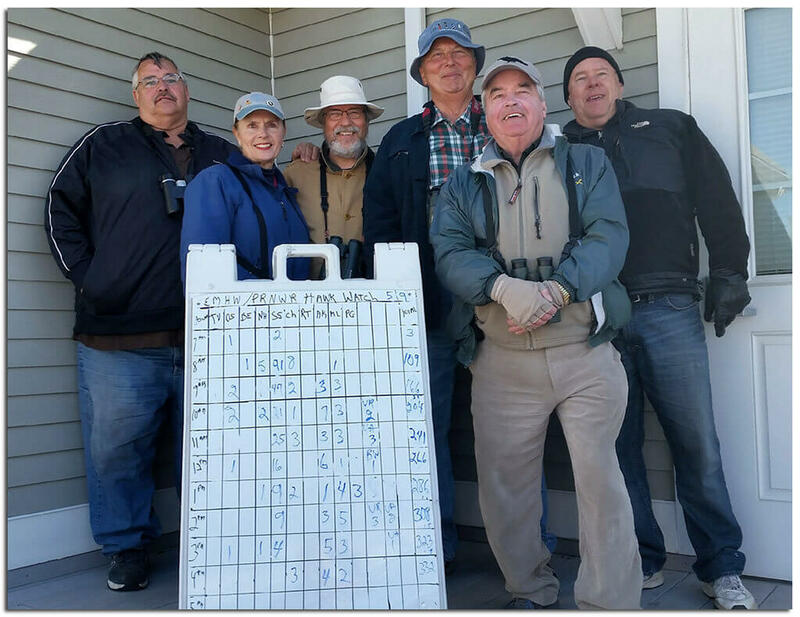 Only 3 birds the first hour, but 105 the second. 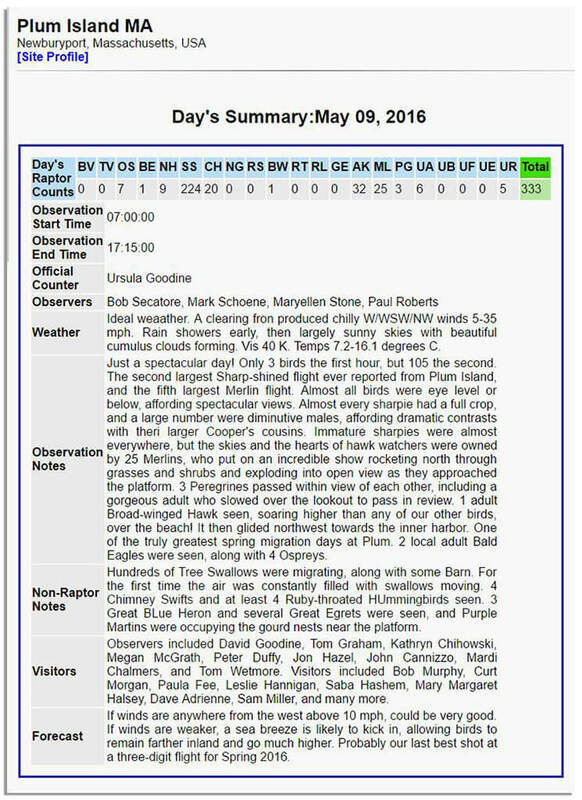 The second largest Sharp-shined flight ever reported from Plum Island, and the fifth largest Merlin flight. Almost all birds were eye level or below, affording spectacular views. Almost every sharpie had a full crop, and a large number were diminutive males, affording dramatic contrasts with theri larger Cooper’s cousins. Immature sharpies were almost everywhere, but the skies and the hearts of hawk watchers were owned by 25 Merlins, who put on an incredible show rocketing north through grasses and shrubs and exploding into open view as they approached the platform. 3 Peregrines passed within view of each other, including a gorgeous adult who slowed over the lookout to pass in review. 1 adult Broad-winged Hawk seen, soaring higher than any of our other birds, over the beach! It then glided northwest towards the inner harbor. One of the truly greatest spring migration days at Plum. 2 local adult Bald Eagles were seen, along with 4 Ospreys. Non-Raptor Notes: Hundreds of Tree Swallows were migrating, along with some Barn. For the first time the air was constantly filled with swallows moving. 4 Chimney Swifts and at least 4 Ruby-throated HUmmingbirds seen. 3 Great BLue Heron and several Great Egrets were seen, and Purple Martins were occupying the gourd nests near the platform. Visitors: Observers included David Goodine, Tom Graham, Kathryn Chihowski, Megan McGrath, Peter Duffy, Jon Hazel, John Cannizzo, Mardi Chalmers, and Tom Wetmore. Visitors included Bob Murphy, Curt Morgan, Paula Fee, Leslie Hannigan, Saba Hashem, Mary Margaret Halsey, Dave Adrienne, Sam Miller, and many more. Forecast: If winds are anywhere from the west above 10 mph, could be very good. If winds are weaker, a sea breeze is likely to kick in, allowing birds to remain farther inland and go much higher. Probably our last best shot at a three-digit flight for Spring 2016.